When it comes to choosing the best bed for your dog, it may seem like there are just too many options to choose from. Making the best selection will require a little research, but KC Dawgz’s expert dog training staff can help you make the best choice for your canine pal. Choosing the right bed for your dog is important because his bed is where he is going to rest and recharge. Consider this: does your dog like to stretch and move around while he rests, or does he curl up when he rests? Measuring the size of your dog at rest can help you determine the size bed he needs. If your dog stretches out his legs while he sleeps, then he will probably need a bed that is large, wide, and square. Dogs that curl up do not need as much space and can do just as well—if not better—with smaller, round beds. Some dog breeds tend toward particular bone and joint complications such as hip dysplasia. Dogs of any breed can develop arthritis, but some are more prone to it than others. If your pup has bone or joint pain or complications, consider a bed with memory foam. Be aware that foam can hold onto odors, so try to find a waterproof cover that you can toss into the washing machine or simply hose off. Bed ventilation is also a concern for dogs with longer, thicker fur. A ventilated bed is best for these breeds. 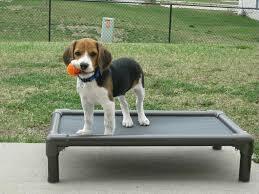 Dog-bed frames let you position your dog’s bed off the ground, which allows air to flow freely. If your dog does not take to sleeping off the ground, then look for beds with cooling pads. The location of your dog’s bed is a factor to be considered in finding the perfect bed, too. Your choice of where to place the bed will also affect the size and shape of bed that you choose to buy. Be sure to give your dog enough space to feel comfortable but not isolated. Knowing the care instructions before you purchase a dog bed can spare you a lot of time and trouble. If you want to be able to wash your pup’s pad, then make sure that you purchase a bed with a washable cover. Otherwise, you may find it difficult to clean her bed with just soap, water, and elbow grease. Rest and relaxation are important to you and your dog, so make sure that you are both happy while doing it. Not sure which bed is best for your dog? Contact one of the on-staff dog trainers and dog-behavior experts at our Kansas Dog Training facility today. We will be happy to help you find the right fit!